Are you looking for a spiritual boost? Deacon Thomas Winninger writes a daily e-mail reflection entitled “Jesus Speaking” that aims to do just that. Discover the meaning to your life. Encounter Jesus on a daily basis. Learn how to live faith in everything you do. Eliminate the frustrations and indecision you face daily. Jesus is speaking to you through these daily morning and evening scripture reflections. Click here to sign up and take a step forward in your spiritual life. Aim Higher, a new campaign to market and promote Catholic Schools in the Archdiocese of St. Paul and Minneapolis, is now employing Social Media to get the message out. We will be using our social media sites, primarily Facebook and Twitter, as a hub for our students, teachers, and parents to spread the good news of Catholic education. It will be a place where people can connect, share news, learn something new and interact with one another. On our Facebook page, we are running an “app of the week” to help teachers and parents engage their kids in fun and unique ways. We will also be running promotional contests to our schools through these pages. Currently we are having an essay contest for our graduates about what their Catholic education meant to them. It will bring energy around the amazing stories in our Catholic schools. The “Bad Catholic” blogger, Marc Barnes, put together a wonderful video with footage from the March for Life earlier this week. I was impressed with the cogent and confident defenses for ‘life’ put forth by the marchers. Their parents should be proud. With 2011 winding down, let’s take a look back at the most viewed blog posts at Catholic Hotdish. Can an unborn child feel pain? This Sunday at the Cathedral of Saint Paul – Cherubic faces. Angelic voices. Heavenly Music. This Sunday, Dec. 18 at 2:30 p.m. the Saint Cecilia Choristers of the Cathedral Choir School of Minnesota present Benjamin Britten’s innocent and beloved Ceremony of Carols with harp accompaniment. The work opens and closes with the choristers processing by candlelight singing the ancient Gregorian chant, Hodie Christus natus est! The Cathedral is located at 239 Selby Avenue, at the corners of Summit Ave. and John Ireland Blvd. There is no cost for the concert; however, a suggested donation of $15 is welcome and appreciated. Britten’s Ceremony of Carols is a masterpiece composed while on board a ship during a perilous five-week crossing of the North Atlantic. The year was 1942 and World War II was at its height as Britten was returning to England from the U.S.A., explains Robert Ridgell, Director of Sacred Music for the Cathedral of Saint Paul. “It is an unusual setting for treble voices and harp, and the ‘carols’ are largely the product of 15th and 16th century writers, mostly anonymous. The work opens and closes with the youth choir processing by candlelight singing to plainsong, the Hodie chant sung for centuries at Vespers on Christmas Eve. The carol settings in-between deal with the traditional stories surrounding the birth of Christ,” adds Ridgell. What’s your favorite Christmas show or movie? The Christmas Holiday season is in full swing, so now seems like a good time to ask, “What’s your favorite Christmas show or movie?” Is it one of the classics like “It’s A Wonderful Life” (pictured above) or something more recent like “The Santa Clause 2”? Whether it’s a TV special like “A Charlie Brown Christmas” or a feature-length film such as “Miracle on 34th Street”, share with us your favorites in the comments below. Upon returning to the Catholic Spirit offices from lunch, I was greeted by the handiwork of the Christmas committee. Nativity scene in our hallway. Nice decorations! Now we just need to add some gifts beneath it. Fill in the blank: This weekend will be a blessing because _____. Tell us in the comments section below why this weekend will be a blessing. A couple weeks ago, I asked why TPT wasn’t following the lead of other PBS affiliates in broadcasting the highly-acclaimed series “Catholicism” by Father Robert Barron. Thank you for your email inquiring about the program Catholicism. After careful review, tpt has declined to air the four-part series “Catholicism”, produced by Word on Fire Catholic Ministries and Picture Show Films. While the program is very well produced and interesting, it does not meet our long-standing requirement that programs carried by tpt be “non-commercial, non-partisan and non-sectarian”. This standard is applied to all tpt programs: those provided by PBS and those (like the “Catholicism” series) coming from a non-PBS source. While our programming policy does permit programming about religion and religious issues, the ‘non-sectarian’ requirement means we generally do not carry programs that express only a single religious point of view, or assert matters of religious faith as fact. In addition, the stated purpose of the producer (Word on Fire Catholic Ministries) is to “reach millions of people to draw them into or back to the Catholic faith.” While tpt recognizes the importance of programming that brings understanding and illumination to matters such as religion, we do not believe the evangelical nature of this series is consistent with our standards. Thank you again, for your interest in our programming. Obviously, this is disappointing news. Especially considering the 700,000 Catholics in the Twin Cities who would benefit from such a program. It’s also puzzling that other PBS affiliates do not share their timidity in providing their viewership with such an engaging and interesting program. If you’d like to express your disappointment in their faint-hearted decision, you can contact them at viewerservices@tpt.org or http://www.tpt.org/?a=contactUs. This past weekend, I was able to attend my first CNMC (Catholic New Media Conference). The fourth annual event was graciously hosted by Archbishop Joseph F. Naumann and the Archdiocese of Kansas City at their Pastoral Center. More than 125 of the best and brightest ‘New Media’ Catholics were in attendance and it was a great experience. Matthew Warner – who will be a presenter at next week’s Archdiocesan Communications Day – has written a synopsis at The National Catholic Register blog. It’s a good read. One of the many wonderful surprises was Auxiliary Bishop Coyne – Archdiocese of Indianpolis – who ‘live’ tweeted the event. 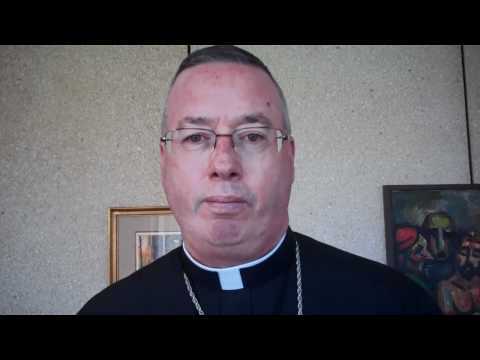 Brandon Vogt recorded a short video interview with the Bishop about his thoughts on Catholic New Media.